Automatically create friendship connections. AutoFriends allows automatic friendship formation between selected users and everyone else in the community including new registrations. If you want to be friends with everyone, this is the way to do it. It works like magic! Search for a user and add them to the list. All newly registered members will now become friends with that user. To create friend connections between all existing members, just click the ‘Befriend all Users’ button. Boom! Done! That’s it! Want to stop making new friends? Just remove the user from the list. 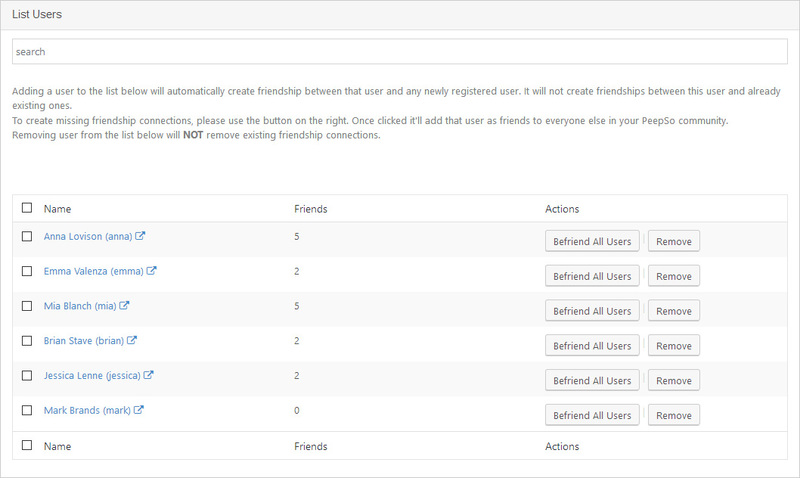 Existing friendship connections will not be affected but the user will no longer become automatic friends with newly registered users. Automatically create friendships relations between a selected user and your entire community. Decide whether to create new friendship connection between a selected user and newly registered ones.